No Real Stress ? – Let’s Create Some ! ..Do we look to create stress and do we secretly see this as a comfort ? …. Last week I was speaking at an evening event for a business organisation – the topic was Reconnection and Mindfulness in life and work. We got involved in the discussion on stress and how this is produced both physically and psychologically and of course spoke of work stresses .. it was a financial institution so end of tax year was a real trigger and avoiding fines by completion to deadlines .. and so on …. and it got me really thinking .. Thinking about stress , the way we use the word to describe almost everything that pushes us slightly out of our comfort zone and the fact that stress is totally a concept we in our modern , safe world have designed.. that for many stress is only relevant to their world and in the greater scheme of things no real harm is done … and yet we remained fixated on stress. If you think about individuals living in much more difficult circumstances , fighting for survival , hunting for food , living in war-torn cities , living with chronic or terminal illness .. we would hand on heart say yes that is stress and actually you didn’t choose it – you didn’t look for it – it came upon you and you needed to work through it. But interestingly for those individuals who are not living in these conditions it appears that a large proportion of humans still actively seek to bring stress in to their world. For clients there is the point in which stress comes upon them due to past events which did cause stress and having not processed these, emotions crop up at totally -unrelated times – causing feelings of stress about the stress or anxiety – help to move forward is needed here. For some it’s a career choice where again there is life and death situations to handle – individuals will have a clear view of why they choose to do this – to help others and potentially to alleviate stress for others whilst taking on stress for themselves . Then there’s the next stage where we really don’t have any life or death situations but we still feel stressed and look to create it – I do this all the time – I am a procrastinator , a last-minute dot-com girl – proud of the fact I never miss a deadline but, take everything up to wire .. and provide myself with a whole load of stress which can often keep me awake at night … why do we do this? .. why not plan ahead? .. what is it that pushes me to do this almost every time .. could it be, we are in fact, addicted to stress and have a need and desire for this which we believe allows us to function? We know that in stress we produce different chemicals in our brain .. adrenalin is a key factor in this .. the waves of adrenalin mixed with excitement or fear can give us an edge , produce focus, allow us to push through barriers … we know that part of our brain is totally focused on keeping us safe – pointing our hidden dangers and ensuring we are in survival mode …. and yet for many of us again this part of the brain is not really needed on a regular basis. Our world is comfort led – the proverbial saber tooth tiger is no longer lurking behind a rock. We see people talking of giving up the stressful life and looking for ways to drop out and live a mindful and peaceful life .. and yet this can cause them to be stressed – the ability to slow down an uncomfortable position in itself. .. and of course we get competitive about stress. Conversations about who is run ragged during their day , who works the longest , whose children are the most to handle and have the most clubs and biggest social life..and finally there is this world the digital world – a world in which we share our happiest times .. and develop comparitonitus so we can be stressed at how well everyone else is doing. I am coming to the conclusion that stress is something we subconsciously seek , that if we were to be given a stress free world we would create concepts and deadlines and rules against which we could measure our stress – almost as if being stressed has become a comfort , a norm that we strive to hold onto …. the question is can we truly as humans alleviate stress from our lives .. and the bigger question is .. do we even want to ? Why not come over to the Bemoore Face Book Group – Reconnection and join in the conversation and find support ? Get involved by subscribing to our YouTube Channel for information on Reconnection and fabulous guest interviews. 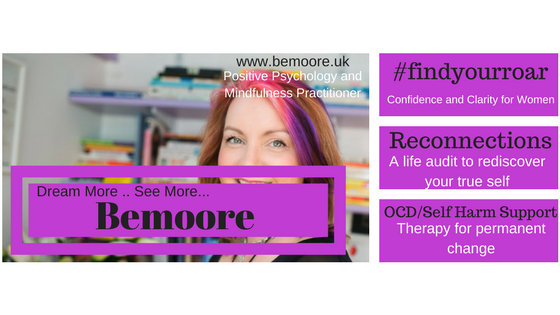 If you need support for stress , anxiety , OCD , Depression or general well-being and confidence drop me a note at amoore@bemooretherapy.co.uk. Confidence – it’s an inside job ! But a little external oomph does no harm ! Through therapy we work with clients to get them to not just think differently ( which can be exhausting to keep up) but to feel differently and confidence is part of that and when you get it ..it can be transformational! We talk about not relying on external factors – because then you are not truly able to be as you wish to be – you look to get validation from others, from situations , from the weather even…and it becomes ingrained that when the external factors are not in your favour – the confidence or feel good factor also goes out the window. But this week 2 things have come to mind .. with clients it’s about how to get started on that journey , because this is also the thing . If you don’t feel confident , then you need to make a start , you need to have something to build on , and feeling confident that you can be confident is a tricky situation to be in. It’s alright for us therapists to say – ‘of course you can do it , of course you can wear it , of course you can say it .. just try – go one ! ‘.. but the fact is there is self-doubt there and encouragement is good but might not be the key that starts the engine… because you have to believe it to be true. And then there is the fact that once you feel confident it doesn’t mean to you always do feel that .. it’s normal for everyone as I have written about before to have that crisis of confidence and want to give yourself and your self-esteem a boost – or a kick up the bum. So this is a time when actually turning to something external could be just what you need. Here’s a few idea .. Create a great playlist and play it loud and sing and dance to raise you up! Write out 3 affirmations of how you would like to be feeling – I Am Amazing / Fabulous / Awesome / Confident – say them out loud and really listen to your voice. Find one item of clothing or one outfit that you love and loves you back – put it on for that added boost. Work with a trusted friend confidante to create a list of things about yourself you like – or they like even and make it visible to you on a daily basis. Start to document your positives and start to write down all the good things which happen .. and if that’s hard then start with simply writing down non negatives. For me there are 4 things I know I have in my tool kit ..
Firstly get up , yoga and get dressed .. if I stay in my PJ’s I find my mood doesn’t lift so well. Put my face on .. yep – putting on my make up and big hair creates a feel good moment for me. Great heels – shallow I know again but when I need to lift myself a great heel does this literally for me. The key is create your tool kit – to use it to get started or bolster you up .. but not to rely on it. Keep working on that inner confidence and your self-esteem but know that sometimes it’s OK to get some help. Check out http://www.bemoore.uk/events for the latest workshops designed to enable you to embrace your true fabulousness. #findyourroar . If you need help with OCD or Self Harm Behaviours drop me a note at amoore@bemooretherapy.co.uk. Coming soon – dedicated webpage to OCD/Self Harm Support and Online coaching course to introduce you to my Reconnection Programme. Is Positivity Over- Rated ? I had a discussion very recently with a client and it got me thinking .. as a therapist I spend a lot of time talking to people about embracing what they like about themselves. Making lists of good qualities, skills and attributes and thinking about leaning into the negative emotions – exploring them and facing their fear! But I wondering if there is a slightly different message to be had. Positive Psychology is everywhere now and I am a big fan of course. .. but I feel it can often be mis- interpreted. That individuals can feel even more pressure to just think positive and all will be well. To like everything about themselves and to not question anything – to embrace the whole person and not want to change anything .. in addition to tackling all the things they feel anxious about. And I realised that it made me feel quite exhausted just thinking about it ..
And it made me think that this is not actually the message we are trying to give. I know as a human being , as a woman – there are things about myself I would like to change slightly. The mum tum I have gained following 4 children spanning 20 years and some surgery is one of them. The fact that I have held onto being a size 12 for most of this time but now as I approach 45 the jeans are starting to feel a tad tight. On an emotional side the way I am struggling with focus at the moment and the pressure I feel to be happy all the time when actually I am noticing my patience is wearing a little thin at times and I am prone to outbursts of crying – especially in the car and especially to anything Celine Dion or Evanesance based ( but that also creates a feeling of anger to be honest ). So here’s the thing – you want to be able to like yourself – that is a given – you should not dislike yourself as a whole – but yes it is OK to have things about you to want to change. Sometimes the change will actually be beneficial like starting a healthier lifestyle or taking into account those emotional outbursts may not be appropriate in all situations …..
Perhaps you are holding onto unhealthy habits emotionally or within relationships or you see behaviours which are not in line with who you would like to be. Simply suppressing them and thinking positive thoughts is not going to cut it if I’m honest – reflection is needed and you need to be brave and say that sometimes change is needed. .. and btw perhaps you have been anxious or putting off a task – rather than putting pressure on yourself to just get on with it – why not question your motives? I had a client who didn’t like being in crowded shops especially supermarkets .. she felt a lot of pressure to change this – but actually when we explored it – she didn’t want to do this task anyway ! .. so rather than simply steam ahead why not check in and see if you actually would really enjoy it – because it s totally OK to say – to be honest I don’t even like it ! I guess what I am trying to say ( and apologies as this has been quite testing to put into words) is that it’s OK to not be OK , it’s OK to not be positive about the whole you , it’s OK to want to make some changes and it’s OK to say no to things …. the bottom line is all about choice . As along as you know it’s your choice and it’s because you want to and you understand the implications of both sides – and you are not doing it because of negative beliefs or comparatonitus to others or because you think you should …. then thats just fine with me ! … just so we are clear – I don’t want to run a marathon … the thought makes me anxious but aside from that I can’t think of anything worse than running for 26 miles so I am not going to …. and I am happy that my mum tum was a result of my children but also happy to admit that part of it is caused by a love of Prosescco and Italian food and rather than simply accept it I do need to make some changes if these size 12’s are going to stay in place much longer ! . Set Your Bar High ! – Value Yourself! Yep They May Have to Pole Vault .. but aren’t you Worth it? Value Yourself has been the phrase of the week and alongside this I have been going on about raising bars and role modelling boundaries – because in a nutshell as they say if you don’t value yourself then why would anyone else? Thankfully for many of us even when we struggle (and I have struggled with this ) we do have people around us who value us despite of our own views and they allow us to start to build on our sense of value but it’s a great phrase to keep in mind – for all the those that will support us there are those that see someone vulnerable , someone who doesn’t know what it means to be valued or feel valued and they will strike. Raise your bar high is about setting out those standards – of how you choose to treat yourself and where you expect others to come in. It is not about having unrealistic expectations, it’s just being clear on what it means to have a healthy relationship with others and self. And once you have that bar in place don’t allow others to slip in underneath it .. you know the ones .. you feel they compromised you or they took advantage , you didn’t feel really comfortable with the way they spoke to you or treated you but they also created a feeling that for them it was acceptable .. it is not ! – Once someone gets in below your bar then you really do set a new low for them and they will not strive to raise up from it! Show people that you treat yourself with kindness and how that relates to those around you. Show people that mistakes can be learned from and we don’t need to keep beating ourselves up . Show people how you create time for self and others and demonstrate compassion and empathy. Use positive language when talking about yourself and give others praise. Acknowledge when you are feeling low and understand that you can work through it. And most importantly when someone tries to get in under the bar by speaking badly to you, commenting or acting with unkindness or in any way creates that feeling that something is off – listen to that inner voice and make a choice to let them know it’s not OK. Not this time , not once , not – it won’t happen again .. be clear it’s not OK.
Value yourself and let others value you back! Set that bar high – and as I said at the start – so people might have to put some energy in get over your bar but so do you and you are worth being valued enough that they will do that. 2 Ways To Tell Your Story! Who Holds The Power ? Last week I posted a short message about story telling and I thought it would be useful to expand on that – because how you tell your story and how you hear others tell their story is a sign that someone in moving on .. or holding on . Dependant on which , depends on where the power is. In this day and age it is even easier to share your stories and experiences through social media. It is often used by people including myself to give reference to our empathy of others situations. That we have gone through life challenges and we have come out the other side. Telling your story can be powerful both to you and to your community. When something happens to an individual , when we feel upset , traumatised , embarrassed or on a lesser scale hard done by or treated badly, we initially hold onto that emotion. It is quite normal to spend time thinking about it. However at some point people start to process the emotion and part of this is an ability to talk about their experience. In the beginning it may be too hard to talk about – it may not feel possible and you don’t want to say it out loud as you have to then accept it – it makes it real. As time goes by you start to share and then some people get to a point where they want to talk about it .. and finally it can become therapeutic to be able to tell your story. A sign that someone is working through the experience is how they frame it – when it includes details of who they are now, of moving on , what they have done since , when they talk about it to express emotion but are not ‘ in ‘ the emotion .. these are all signs that the story telling is on their terms. And this can be a powerful healing tool! When this happens it says – the power is in my hands ! – to tell my story my way ! – to let others hear my experience and share what happened next. Incidentally this story telling isn’t triggered by a reminder or a chance encounter with the person – it is told when you feel it will be beneficial. You are not at the mercy of circumstance! There is very little or no mention of what has happened since – the whole piece focuses on the incident and the person in hand. They or you are driven on impulse to tell the story when it dictates! When this happens .. much as you or the person telling it will think they are in control .. actually they are handing the power over the other person. They are allowing that person to create emotions in them and allowing them to set them off balance. They are allowing the incident or event to still impact on their lives and control what happens to them and how they feel. So as you can see there is very much 2 ways to tell a story ! It’s important to be mindful of where you are at. If after reading this you are thinking ‘ oh that’s me’ I keep going back to that ‘ then it’s time to make change. It’s a simple process but it’s not easy – but you can make it happen – it just takes practise. You have to watch for those thoughts starting to come through and you have to make a point of saying no to yourself – that you won’t go there and allow yourself to build it up. Ask your friends to be supporters not enablers ‘ If you hear me start to tell that again – please remind me I don’t want to bring that all up and please don’t let’s talk about it when we meet’ . And be a good friend in return – let your friends know when they are falling into that trap themselves that you kindly bring them back on track ‘ I notice you still seem really hurt by that ‘ or ‘ I notice you bring that up a lot still and it is very raw’. Have a fabulous and mindful week and why not come over to the Bemoore Facebook community and join in the chat . and don’t forget to sign up for your Empowerment Day Ticket for the 8th May or come and see me at the Tower of London on May 13th for the Feminist Fete event! It’s Not How Loud You Roar on the Outside! A Roar Comes From Within ! n my networking this week we explored the difference between Introvert and Extrovert. As a dedicated Introvert it has often occurred to me that people might assume that the louder you Roar the greater the impact… and this might be true, but it really is all about what you mean by Roar. Being the person who talks to women about Roar on a regular basis it’s good to be clear on these things. In the business world and the realm of Women in Leadership there is often debate on what makes a great leader. Previously it was all about being one of the boys, being tough but of course not coming across as hard- nosed – a difficult balancing act and in my few often very much an act, based on what we thought was expected and needed. Looking back on my most influential and effective women leaders it was those that could create a moment without raising their voice , that could command a room simply upon entering it , those that when called you into the office would quietly explain the feedback, which seemed much more dramatic than being shouted out … and those were the ones I felt most inspired by and most wanted to impress. For me Roar is not about introvert or extrovert … it’s about that belief in yourself. Embracing your skills and your attributes and letting them shine through. It’s about handling situations in a way which is congruent with your choice of intention and behaviour. Roar isn’t about the external it’s all about the internal. .and you know when you have found it. You can channel it and you can almost feel that physical straightening of your back, head going slightly higher, resilience kicking in. The knowing that you can take on the challenges without taking on the act. Start by taking some time to explore your own skills, thinking about how you put them to use. Explore your personality and your chosen way of communicating. Think about times when you had success by embracing your attributes. Now consider those times when you put your true skills to one side and notice whether it felt different. Start to be aware of situations when you don’t feel comfortable being you and ask yourself why this is? What would be different if you could be more you and what holds you back? Embracing your youness is not about being inflexible or not taking others into account – quite the opposite in fact – when you are comfortable with who you are, you can really start to see how your relationships are panning out and whether adjustment is needed. If you always put on an act it will always be slightly different so how can you really see the dynamics? Fundamentally your Roar is your being not your doing… you can have the loudest Roar in the room … and not speak a single word! Ali is a Therapist and Coach committed to empowering women to feel confident in self. Ali is the Lead Speaker for the up and coming Tower of London Feminist Fete in May 2018. Why not join her FaceBook page and get involved in the Bemoore world. ‘It’s there again – the buzzing in my head , moving outward like an itch under the skin , the anxiety creeps in .. the voice keeps talking – the buzzing gets louder .. I try to ignore it , suppress it .. it just keeps coming like a drill in my brain .. and then the fear .. If I don’t listen, if I don’t do it , get it just right, something bad will happen .. no it won’t what are you saying ? – yes it will .. do it .. do it … DO IT! This is a description from one of my clients who was trapped in the cycle of OCD. As we spoke about during my awareness week this is a very different picture than one sometimes portrayed by people who use phrases such as – ‘oh that’s my OCD kicking in .. ‘or ‘I am a little bit OCD with that.’.so let’s be clear you are never just a little bit OCD. If you have OCD – Obsessive Compulsive Disorder – then you have it full on . Yes to different degrees but to have a disorder it needs to be having a direct impact on your life and your ability to function in the way you would want to . – so there is no such thing as ‘ a little bit OCD!’ .. and those reading this who are living with it or have experienced someone living with it will know it’s not be belittled and it’s not something you want. However just as it’s my firm believe that you can’t just be a bit OCD – it is also my firm belief that you can become totally NOT OCD.. yes permanent relief and recovery is possible. I can’t go through the whole process in one blog but in this I want to focus on one of the first and most important principles I teach when working with people in this space – the principle that allows them to gain a different perspective and to lay the foundations for what is to come.. this principle does not cure the problem in itself ( much as I wish for my clients it would) but it gives them a view-point that creates a change .. and with change we have transformation and with transformation we can move from the space of simply doing things differently to actually being and feeling different. This is a different type of thought and feeling which is owns space alongside logical thought and working as it should – to protect ourselves from danger — so for example you might have a thought that if you step out in front of the car approaching you will be injured .. and this creates a feeling of natural nervousness and then we take action by stepping back. Then you cross when it’s clear and you pay no more attention to it. The thoughts and feelings in the OCD cycle are not working in the space with our logical thought – they are not based on actual events – they are based on illogical thoughts and perceived reactions. With Mindfulness Based therapy we don’t spend energy at this stage trying to change the thought – we look to accept we are having this thought .. and it is just that a thought we having. However we are now learning to be fully present and understanding that right now we are sitting in the therapy chair perhaps , holding a warming cup of tea , the thought can stay there but we do not have to act and it cannot, on it’s own, become more than a thought. In the same way a feeling we experience is our body going through a physiological reaction or a psychological reaction. It is the feeling it is – we acknowledge that – perhaps it is anxiety , perhaps it is fear , – however again we do not need to take action. As we learn to explore this we see that when we do not take action – the feared event does not happen. .. and so our brain starts to be re-trained with the evidence. More and more I find that Mindfulness is a tool which works alongside traditional therapy – to create the space in which to see different choices – to remove us from the noise that is hindering us and allow us to start to simply be and breath … and in this space #recoveryispossible. Online coaching course to introduce you to my Reconnection Programme. What ever gets you through the day ! Faith , Belief , Hope … and mugs of tea …. Fresh start week is coming to a close at Bemoore and people have been exploring the process of valuing self , making themselves a priority and also following on from last weeks blog, acceptance of now. Something which has been on my mind lately around this is the thought of what we turn to in times of difficulty for comfort and support. What keeps us on track outside of that inner motivation? In my studies for becoming a Celebrant in my community there is much about valuing different types of faiths and beliefs. Celebrant services can be based on anychosen religion or faith system and this can of course include Humanist views or non religious beliefs. The importance for us in our role is to be mindful and respectful of all the different faiths and beliefs we can come across. In my professional life as a therapist I am all about the science behind the support. What evidence is there that an approach works? – firstly through traditional forms of therapy and then through our newer approaches such as Mindfulness it is important to understand the actual tangible impact on the brain … but brain and mind are two different things ( something worth exploring further in the wonderful Dan Seigal book – Mind ). Brain is making changes and re- wiring but mind is about mind-set and our inner thoughts. For me a combination of both scientific approach and embracing a belief and a way of seeing the world are a big part of my work with clients. I can be discussing the reconsolidation of memory through the neurological system one moment and just as happy to chat through a spiritual view or a form of visualization in the next. In my private life faith plays a role for me and my exploration in recent years has expanded. I started out being brought up in the Church of England – non practising really apart from the usual but I remember going to Sunday school – I am not sure why I went or whose choice but I went for quite a while. Then as a teenager I went to the local Catholic school – my dad’s family were lapsed Catholic’s but I had no knowledge of this faith system – the school was very local and I had been bullied in my previous and this was a fresh start for me as not many of my previous peer group were transferring. Then in my twenties I discovered Paganism and initially an interest in Wicca . It seemed quite daring and was still not covered by laws such as the Religious Discrimination Act which didn’t come into play until 2005. I found it fascinating to learn such a different way of thinking and to discover such a peaceful and nature based way of life. This faith system has stayed with me throughout my adult life. I again can’t say I am the most dedicated but I like to attend the Chalice Well for main celebrations and my faith was tested, but also a great sense of comfort for me when I lost my son 10 years ago. I like many was angry at my loss ,but I was blessed in the sense that the hospital chaplain ( a Christian man) came to visit and he was respectful of my beliefs and he agreed to hold the funeral service incorporating some key points and words which meant I could have my faith included . It was a wonderful sign of religious inclusiveness which often I feel is missing for many people. It showed me that we could comfort one another, even though we believed different things, we could still be a community. As the years have passed I have become interested in many different paths – Buddhism and now the new belief system which is seen as Spirituality but not always alongside a faith in something bigger. Spirituality is about how you feel in side . Whether you are in line with your intentions and purpose – anyone can experience spirituality of self and others and world even if they hold no religious beliefs – that is my view anyway. And it comes through with clients who have not got a specific faith but in times of challenges look for something to turn to. To describe how they feel , to comfort and to look to answers that they cannot put their finger on. Many people I speak to now talk of the Universe listening ( something I firmly believe in) .. or of giving and receiving of the right energy to make positive change. My view I guess is that all faiths and believes are worth respecting – do not be dismissive.. however as we say in the Pagan world – ‘Do as you will – lest it harms non or thrice back it will come’ – basically be kind to others or the universe is listening and karma will out. For me what ever gets you through the day or the difficult time or gives you some peace is something worth holding onto. Whatever you call it and of course not forgetting that all important fixer of all things – the mug of tea which is ever present in my therapy room at home. First you need to accept the you you are now .. and the memories which have already been made .. then you can make change. A theme through this week’s thoughts and posts at Bemoore HQ has been about facing up to past events, taking on past emotions and accepting the you you are right now. Clients are often very keen to move on and make change – to escape and put behind them past trauma. This is so understandable. However when past incidents are still not resolved and past emotion is still lurking, the current presenting problems in the now will not simply go away by thinking about things differently – although this is a part of making change… but only a part. You see the past does matter .. it is part of where you are now and who you are now. Everything which we experience leads us to make choices.. some we feel very in control of and others we feel are made for us.. but each of these experiences leads us to the now. So trying to simply pretend the past did not happen in itself to me is madness. It did happen , it cannot un-happen. Just filing it away in that invisible box and closing the lid – hoping and hoping it never starts to peak through. – Yep done that myself a lot! Brooding over what they could or should have done differently . – Yep again also that ! Just as the first won’t truly resolve things then the second is using wasted energy. Which brings us back to facing up to it and accepting. I work with clients to help them safely go back to those traumatic experiences and reconsolidate the memory with the lingering emotion. To gain a greater understanding of what happened and to see things from a different perspective. It can seem scary at first to have to go back and re live what has happened.. it is not always clear what incident or incidents need to be addressed but with time and patience it happens…. and the more the client sees that by doing this they feel released from those symptoms happening the present they can make peace with the past and create a truly new future. Acceptance does not mean liking but it does mean to settle and from there you find the peace and the space and the stillness to truly make change. p.s why not come over to my Facebook group Bemoore Reconnections and join in the conversations and live videos – be part of a community to support and share . This week in the UK we have been in the grip of the Beast from the East who has now been overthrown as is the way of a high achieving woman by Storm Emma… overall it’s been snowy and cold and for many chaos. For me this is the first time we have had real ‘ weather’ since I became fully self employed and actually therefore have been able to adjust my schedule and in some way go back to living with the seasons in a way we are perhaps meant to be. Most appointments were cancelled and road trips postponed so I found myself with a few days to fill and to simply be able to focus. I noticed that throughout the chaos what I did observe was a coming together of community. People sharing stories of adversity, charities helping those on the streets , checking in on relatives -coming together in the well known phrase ‘ Spirit of the Blitz’ . For although we get snow and cold weather on a regular basis in the UK it always seems to be a total surprise when it happens! My community groups were exploring self care and gratitude and someone said about living seasonally. Being active and outside in the summer months and gathering and retreating in the colder times. Of course in these modern days we expect to carry on as normal but this week has made me think perhaps our minds and our bodies at still programmed to need that seasonal life and this weather has for many forced some downtime on them they would not normally have had. Snow itself brings a feeling of stillness – a different type of light – as if nature is taking stock. With no pressure to go into work for many , schools closed and public transport down there has been a quiet acceptance of the space – the term Snow Day has been coined when families and friends are coming together to enjoy the activities only snow will bring. For me the snow days have brought about not just a sense of peace but also a weird productivity. Rather than feeling the days stretching out I have found myself focused on individual tasks – study , reading , admin – the things that bother me and that I normally fight to fit in between tasks. With the ability to simply sit and work on something without watching the clock my attention span appears to have increased and I no longer feel restless. Even my morning routine is back on track- sleeping in slightly later without ‘fear of lateness’ and then enjoying the activity of yoga and dog walking. Now many will say ‘well other countries simply just carry on’ and yet I do believe that cultures that live with extreme weather do make adjustments. One of my members talked of the notion of ‘ Hygge’ the Danish way of approaching life – it’s a feeling not a interior design concept as much as we seem to be bombarded with this theory, and means to truly embrace the moment and have slowness- not surprising this seems most embraced in the dark winter months. Perhaps other countries are more prepared from a logistical point of view but perhaps also their view of what this time of year means allows them to appear more at one with the elements. – there is no bad weather – only bad clothing ! Next week the snow will clear for most of us and the routine and pressures of day to day life will resume – I will be interested to observe the impact this will have on my mind-set. Certainly I have enjoyed this slow time that snow time brings whilst of course being mindful of those who have experienced hardship or loss because of it.